VertaseFLI was employed by Coventry City Council to undertake remediation and ground improvement works on this former landfill. The site was infilled with demolition waste following clearance of buildings damaged by bombing during WWII. Contaminants of concern included localised TPH, cement bonded asbestos and widespread heavy metals. The site was being utilised as a public park but it was proposed to develop two thirds with residential and the remaining would be returned to high quality park. Receptors included existing and proposed site users, groundwater and an adjacent locally important surface water course. Due to the proximity of the works to existing housing and the sensitive adjacent water course, the project required extensive environmental monitoring of dust, odour, noise, vibration, gas, surface water and groundwater. In addition to the geoenvironmental objectives, a key requirement was to establish an appropriate development platform for the residential development upon 4m of loose tipped and unconsolidated fill. 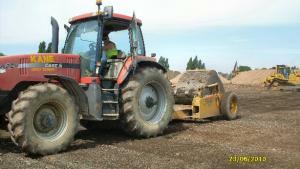 In combination with the required remediation earthworks, dynamic compaction was deemed the most appropriate methodology. The remediation included site wide strip, excavation of localised hotspots followed by ex-situ bioremediation, localised pump and treat of contaminated groundwater, further risk assessment to allow the reuse of asbestos materials, and appropriate classification and validation of soils prior to reinstatement with method related compaction. The works also included the decommissioning of a deep redundant sewer using pumped foamed concrete. Comprehensive dynamic compaction was carried out across the proposed residential development area including extensive and full time monitoring of induced settlement. The site also formed part of a cluster arrangement (being the hub and receiving site) under CL:Aire The Definition of Waste: Development Industry Code of Practice. 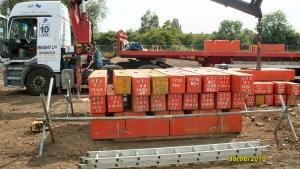 Over 14,000m3 of contaminated fill was imported onto the site. Following successful completion of the works, the new park area was reinstated to a higher quality than historically, and the residential area was left with a robust and fully validated (geo-environmental and geotechnical) development platform.